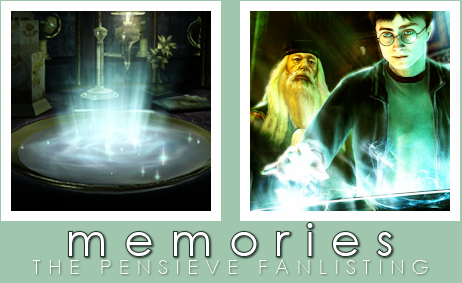 Welcome to Memories, the one and only tfl-approved fanlisting for the Pensieve from the Harry Potter movies/books. If you're a fan of the pensieve, please feel free to grab a code and join the listing! This fanlisting was previously owned by Christina, Shannon, Hannah and Renate and handed down to me in May 2011. This fanlisting is powered by Enthusiast It was last updated: April 9th, 2019 and has 62 members from 23 countries. There are 0 pending members with the newest members Gill and a growth rate: 0.01 fans/day. It is owned by Chrisie. We're listed at TFL.org. This site is in no way affiliated with J.K. Rowling or any other related parties.